The desert is not the place where you would look for cats, but nonetheless it is the place where one of the most formidable cats in the world lives its everyday life. This cat is the sand cat. At first glance the sand cat looks like an ordinary tabby. It's no bigger than a large house cat and has short yellowish-red fur. The resemblance is no coincidence. 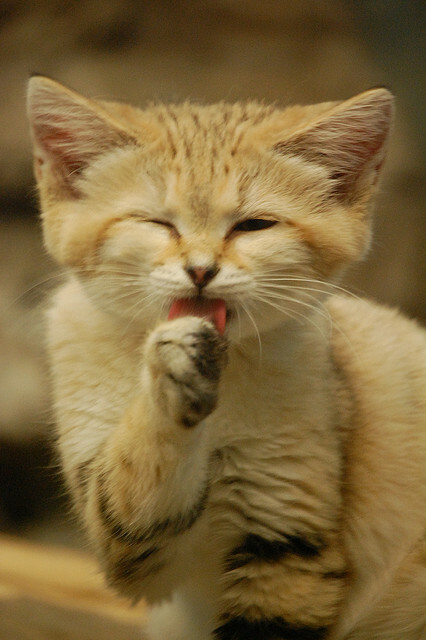 The sand cat is closely related to the African wildcat, Felis silvestris libyca. It is believed to be the ancestor of all domestic cats. Like pet tabbies, the sand cat has a distinct pattern of dark stripes through its fur. In the wild, these markings help camouflage the sand cat against desert rocks and sand. The sand cat is distinguished by its broad head and the wide space between its ears. Its feet are equipped with thick cushions of hair that help it run across deep sand without sinking. Because this cat is very rare and very shy, scientists know little about it. Like other desert cats, sand cats likely dig burrows in soft sand dunes. The den is a place of refuge from the cold desert night, as well as from the midday heat. Sand cats probably hunt in the early morning and after dusk, when temperatures are moderate. These creatures have been spotted in places as far apart as Western Sahara, Israel, and Pakistan. Those living in Pakistan are officially endangered. On the hopeful side, these felines may survive precisely because they are so careful to avoid humans. Adult sand cats are about the size of a domestic cat but their ears are set quite low on their head, possibly to keep the sand out, but also to direct their hearing towards the ground to listen for prey. They are also excellent diggers which help them to catch prey and to make burrows for themselves to shelter from the scorching sun. Thick cushions of long hair protect the cat's feet from the hot desert sand. These foot cushions also act like snowshoes. They prevent the cat from sinking into the sand. Their mating period lasts a week and the after two months 3 cats are born on average. They will grow fast and will reach most of their body mass by the time they are five months. They will become completely independent when they are six to eight months old and are already eating some solid food.